Entebbe is an attractive, peaceful and a very pleasant town in Uganda. There is state house of President of Uganda and there is a possibility of encountering him or any beautiful wildlife at any turn.Ugandans are very lively and they are happy to start up a conversation or help you out when you are on a trip to Entebbe. Once you set off your flights to Entebbe you can enjoy its pleasant weather, parks, old colonial gardens, islands, fishing, boating, music, national zoo, restaurants, and hotels. The weather like in Entebbe? Entebbe has tropical rainforest climate. January is the driest month with 22-26°C temperature. 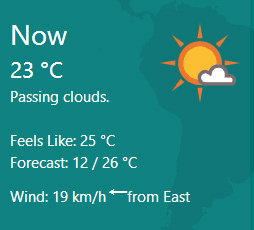 The temperature in February is 23-26°C. In March it is 23-26°C and also there is an expectation of eighteen days of rain in this month. April is the wettest month. From April to may the climate is tolerable and temperature rises to 24-25°C. June is a favorable month with 21-24°C temperature. July is the coolest month with 21-24°C temperature and there is approximately 14% rain in this month. August has a favorable climate with 21-25°C temperature and there is 81 mm of rainfall during this month. The climate is tolerable between September and December with 22-25°C temperature. What is the best time to fly to Entebbe? The best time to visit Entebbe is during the months of July, March, and October. Because the weather during these months is neither too sunny nor too chilly. So that, you can explore most of the tourist attractions and make your holidays memorable.You can also visit Entebbe during festival seasons (for example Christmas and New Year holidays), but it is good to make your reservations two months in advance to avoid the price hike. You can also plan a trip in low tourist season including March, May, June, July, August or September because during these months prices drop, accommodations are great in number and most flights and hotels offer cheap packages. October, November, and December are the rainiest months and you cannot enjoy much during these months. So, it's not a suitable time for tourism. But if you like rain you can visit Entebbe in the month of November and you will have a chance to enjoy the city's annual World Music Festival. The survey shows that the best time to book a flight for Entebbe is Monday for having cheapest flight rates. Or you can book a flight on Tuesday, Wednesday, and Saturday. The flight distance between London and Entebbe is 4,030 miles and average flight time is approximately 10 hours and 15 minutes. Entebbe International Airport is serving Entebbe and has several African and International airlines. It is the largest commercial and military airport. There are flights from different cities with Ethiopian Airlines, Emirates, Qatar Airways, Turkish Airlines, South African Airways, Brussels Airlines, KLM, Etihad and Kenya Airways. There are many direct flights to Entebbe as well as regional hubs like Dar-e-Salaam from which you can have a connecting flight. Boda-boda, matatu and special hire are used for transportation. Boda-boda (motorcycle) is the fastest and most dangerous vehicle. It is wiser to hire a taxi instead of using it because it is a major risk for both riders and pedestrians. Matatu is a minibus and also known as a taxi in Uganda. It is a cheap, safe and slow vehicle. Saloon car taxis are called special hires. There are very few taxis which have meters. So, it is better to settle down the fare before you get in the car. Lake Victoria - is the largest lake of Entebbe. You can enjoy dinner on the sandy beach at restaurants like Goretti's Pizzeria, Bar, and Grill. You can also enjoy a boat ride on the lake. Ziika Forest - is a tropical forest near Entebbe where zika virus was discovered. Wild Frontiers Uganda Safaris is amazing for bird watching. There are drinks with reasonable prices for sale during the trip which can be helpful for the heat. Uganda Wildlife Educational Centre - (also called zoo) is a place where you can enjoy plants, trees, vegetation and chance of encountering with the chimpanzees. There are play facilities for kids. There is a collection of wildlife including giraffes, hyenas, zebras, lions, and crocodiles. To give you the natural feeling they are held in natural like areas. Entebbe National Botanical Gardens - is the best place to spend a full day enjoying flowers, birds, monkeys, plants, and trees. It is supposed filming site of original Tarzan movie. Fishing - The surrounding of Entebbe includes islands and offers fishing opportunities.You can catch freshwater fish here and you can also have a short trip from Entebbe to Mabamba Swamp which is the best place to see water birds. And if you are interested in snakes, you can visit Reptile village, a snake park on a short drive from Entebbe. Ngamba Chimpanzee - Island is a place where you can have interaction with chimpanzees. You can spend a whole night here to enjoy the island and activities of chimpanzees. You can enjoy boating and fishing at Lake Victoria. Or you can enjoy playing golf at Entebbe Golf Club Play. There are so many restaurants including Thai Garden, Anna's Corner, Faze 3, Imperial Resort Beach Hotel, Goretti's Beachside Pizzeria and Grill, Gately Inn Entebbe where you can find soup, fish, and chips, wood-fired pizzas, meat dishes or whatever tickles your taste buds. The Mileage World musical festival is an annual festival held at Botanical Gardens in Entebbe. There is a celebration of world music, cultural dances, games, stories, and poems. Art pieces are also sold during this festival. Fishing Festival is an initiative festival held at the shores f Lake Victoria. It is organized for bringing together families to have fun. The Dragon Boat festival is the most popular Chinese water sport. There is lots of entertainment during this festival.